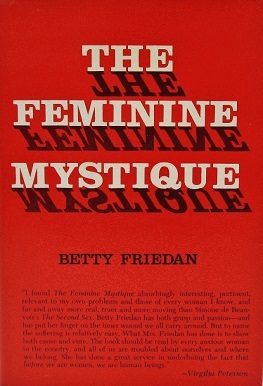 I just finished reading The Feminine Mystique, published 50 years ago by Betty Friedan as an exploration into why so many American housewives were unhappy in the 1950s and 1960s. It’s credited with starting the feminist movement in the 1960s, and I was curious to understand more about it in light of the Lean In Movement that’s taking hold today. I found myself chuckling as I read Chapter 10, where Friedan wrote about housewives who unconsciously stretch their home duties to fill the time available. Why would anyone do this? Because the feminine mystique taught women that this was their role, and if they ever completed their tasks they would no longer be needed. Based on that line of thinking, I know I’ll always be needed; my household to-do list is never-ending! For today’s working parents, there are never enough hours in the day. We develop coping skills to make it all work, some more extreme than others. Do we allow our household duties to expand to fit the available time? Maybe, but that time is next to nothing. What I’ve seen in myself and my friends is that we’ve mastered the ability to shrink our household duties down to the bare minimum. Embrace the sleight of hand. Tend to common areas more than the bedrooms to create the effect of a tidy home. Don’t mop the whole floor, just wipe up the spots. Have places to quickly hide clutter before guests arrive. I especially love closing the doors to my kids’ rooms. I’m a neat freak, and I keep telling myself that what I can’t see shouldn’t bother me. Rethink your standards. Only do the housework that’s important to you. Do the beds really need to be made every morning? As your children help with household chores, don’t expect the same level of quality that you might do yourself. Every Sunday when my kids do their laundry, I think of a good friend who warned me that my kids may decide to “live” out of their laundry baskets, never bothering folding their clean clothes. Unless you’re going to a fancy event, let them wear wrinkled clothing! Remember, your house is an active, lived-in house. Make it as clean as you need it to be, and don’t worry about what others think. Assemble meals rather than cook them. Look for healthy, pre-prepared food to use to make a meal. Pair frozen entrees with fresh vegetables. Heat left-over chicken with a jar of Indian simmer sauce. Buy frozen risotto and serve it with a salad. Turn breaded, baked frozen fish filets into fish tacos. There are lots of these options for saving time in the kitchen. Don’t feel guilty about using them. Master extreme efficiency. Simplify meal clean-up by grilling, using a slow cooker, or keeping pots to a minimum. Serve meals straight from the stove to avoid using serving dishes that will need to be cleaned. Do chores like unloading the dishwasher or folding laundry while your kids eat breakfast so that you can talk to them but still knock something off your list. Wash clothes only when they they fail the “smell” test or are stained. Buy stamps at the grocery store or online to save a trip to the post office. Set up auto-pay for your regular bills. You get the picture. Delegate as much as possible. If you can afford help, hire a housekeeper, gardener, accountant, and others. Split chores with your partner. Enlist your kids in cleaning activities at an early age. Train your family that when they make a mess, they clean it up. Simplify your life. Get rid of things you don’t need. Less stuff means less to tidy and clean! Keep a “to donate” box in your closet or garage to collect things as you come across them to avoid a big cleanup. Unsubscribe from unwanted email as it comes in. Sort your postal mail next to your recycling bin so that you can get rid of junk right away. Have fun! Invite friends over so you have reasons to de-clutter and accomplish some of that housework that never seems to get done. Blast your favorite music or listen to podcasts while cleaning. And then enjoy sharing your home with friends! What are your strategies to shrink household duties to the bare minimum? Please share them in the comments. We’d all like to hear from you. To my good friends: thank you for sharing your strategies for this blog post. Remember: if you reach the end of your rope, tie a knot, hang on, and call one of us! My tip is to try and do a litte of your choses every day so that nothing piles up – our washing machine was broken for a week and the amount of laundry was massive, I am still folding those clothes! 🙂 If i do a load a day or sweep each night or make sure we have the dishes done every night, etc… there is never HOURS of work to be done. Thank you for commenting, Jennifer. A chore a day. I like it! This is a good list of tips. I’ve always been a big fan of the slow cooker! And I agree about keeping things simple and avoiding clutter. You might enjoy the book “A Strange Stirring” by Stephanie Coontz. It was inspired by Friedan’s book but is based on intensive research and in-depth interviews. Thank you for the book recommendation. Much appreciated! Absolutely yes to the slow cooker! And make extra to freeze in single servings for those days when even the best laid plans go awry. I also use slow cooker liners, no clean up! I will have to buy some liners for my slow cooker….efficiency on top of efficiency. Perfect!